Mexicans have this wonderful creation called Mexican hot chocolate. Basically it’s a really rich and creamy hot chocolate but they add a pinch of cayenne to it. The pepper gives it a nice kick and blends really well with the milk and the chocolate flavors. They also have a similar chocolate pepper combo in mole sauce. Mole is pronounced like ole, as in what you say when a bull rushes by you. Or like the Oil of Olay stuff that old ladies smear on their faces. In case you were wondering. LOL. From reading recipes for mole sauce, I’m not exactly sure what the English translation of mole is but I’m guessing it means “loaded with calories.” Every variation I found was waist widening levels so I figured I would play around in the Quest Kitchen and see what I could come up with. Since a sauce often requires using oils or other ingredients that can add up quickly, I went with a dry rub instead. 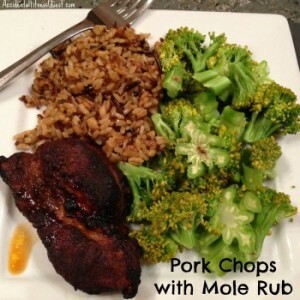 Rubs work well on cuts of meat with a little bit of fat like pork chops, boneless pork ribs, or steaks. They don’t work quite as well on chicken breasts since those tend to be lower in fat and drier. You can get away with using leaner cuts of pork or steak like I did here, so don’t think you have to go ribeye or t-bone with loads of fat for this to work. Just know that your mileage may vary if you try this with chicken. Preheat the broiler on your oven. Line a cookie sheet with foil and spray with non-stick spray. Mix the spices in a shallow dish, and rub the pork pieces evenly with the rub until coated on all sides. Place the pork on the cookie sheet, and broil for about 7 minutes per side until cooked thoroughly. Remove from heat and let them rest for about 5 minutes. Makes 4 servings at approximately 153 calories – 24g protein, 3g carbs, and 5g fat. You could easily do this on the grill instead of using the broiler on your oven. Both work well but grilling requires better weather than I was willing to tolerate in the making of this recipe. Think outside the box for your leftovers. I had plenty left and made a Mexican mole salad the next day with tomatoes, spinach, kale and cucumbers and toss in sliced mole pork. You could also slice the pork and put it in tortillas with cabbage and cheese to make a taco, quesadilla or burrito. You could also double the recipe and get twice as much. Freeze some for later. I love making things like this where you can get several different meals out of one single recipe. So quick and easy, plus you get to eat for a few days. Have you ever tried Mexican hot chocolate or mole sauce? What did you think?